In their recent evaluation of California’s Self-Generation Incentive Program (SGIP) for customer-sited energy storage projects, Itron and E3 found that contrary to program goals, and for the second year in a row, SGIP projects caused a net increase in greenhouse gas (GHG) emissions in 2017. The analysis, recently published by the California Public Utilities Commission (CPUC), looked at a representative sampling of the state’s 828 behind-the-meter (BTM) storage installations, which collectively represent about 67 megawatts (MW) of rebated capacity. SGIP raised GHG emissions because current electricity rates don’t align with grid needs or policy goals. When customers use storage to maximize bill savings, higher GHG emissions result. Changing rate design can solve this mismatch. 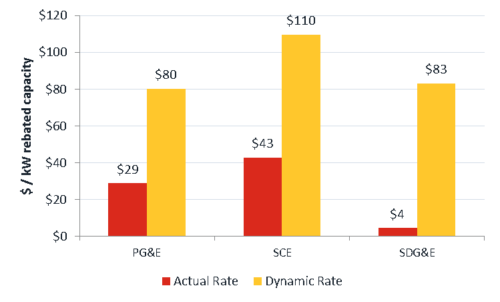 Itron and E3 found that implementing more dynamic rates for customers of California’s three major investor-owned utilities would enable BTM storage projects to deliver far greater system-wide savings even when they’re optimized for individual customer savings (see graphic). It would also decrease carbon emissions. S.B. 700, which awaits Gov. Brown’s signature, extends SGIP until 2026 with an additional $800 million for nearly three gigawatts (GW) of new storage. A recent CPUC staff proposal would require time-varying rates for residential customers and a new GHG performance standard for commercial customers. E3 and Itron have collaborated on the CPUC’s SGIP storage impact evaluations since 2013. E3 experts Eric Cutter, Lucy McKenzie, Alison Ong, Oliver Garnett, and Robbie Shaw contributed to the 2017 report. Check out related press from Utility Dive here and here.